Ever wanted to hide some data from others and the only option you have is hiding the folder? Not a great option when you know that its only too easy to see hidden folders following a simple drill. Tools> Folder Options> View> Show hidden files and folders. 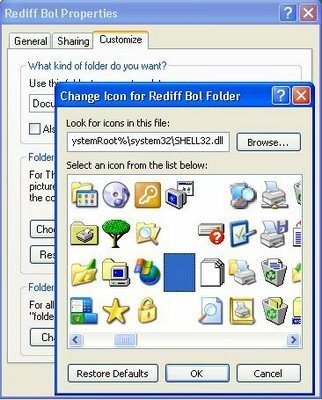 What I am writing about is a very simple drill available in XP and you dont need any additional software to create this invisible folder. It is better than the hidden folders in the sense that it doesn’t show even when “show hidden folders” is on and only you know that the folder exists there. Of course you don’t want Â to put any highly confidential data in there as this invisible folder is difficult to find, not impossible. If you want to know how to find this invisible folder, please leave a comment, I’ll reply. You willÂ see that the folder has no name. 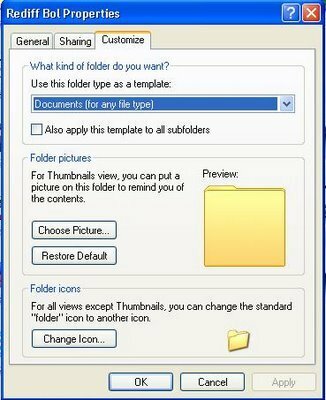 4.Now right click on the nameless folder, select properties. Go to the customize tab. You will see a Change Icon button at the bottom,click it. Click OK and your invisible folder has been created.Only you know that this folder exists. You can keep anything u want in here. Even though this trick appears to be too simple, i does work. Give it a try and share your feedback with us here in comments. P.S: This workaround isÂ only forÂ XP and I am not sure about Vista , give it a try and let me know. This surely works in Vista. How do I rename or delete it. I am stuck. hi ss. Good that it works in Vista too. If you want to delete it or rename it, just click on the place where you created it. You will see something gets selected. Right click on it , either to delete it or rename it. No, that way nothing happens. I googled the prob & found the sol. You have to enter the command mode. Change “cd” to the directory entering full path where the folder is. Then rename using ren command. REN “ALT+0160” NEW NAME. Within the quotes you have to press ALT key while typing 0160. The procedure is the same as described in the above article. Use NUM PAD Keys while NUM LOCK is on. Only then you can delete it. Yes, you are right. Using command prompt, you can do delete or rename as you described. But the way which i told you in previous comment too works as i had tested it on my system (on XP) before posting it here and it was much easier than command prompt. Ok, but I couldnt do it the simple way on Vista.